The ruling Patriotic Front has said that the reported prison visit by former Copperbelt Minister Hon Mwenya Musenge is nothing but a failed political stint. The Former Copperbelt Minister is reported in the MAST newspaper that he was yesterday sent away from Lusaka Central Prison when he went to visit incarcerated UPND leader Hakainde Hichilema and former PF member Obvious Mwaliteta. In a statement released to the media and signed by Sunday Chanda, the Media Director, PF said that party had no issues with how people nomadically and politically align themselves. Lusaka, Zambia – The reported prison visit by former Copperbelt Minister Hon Mwenya Musenge is nothing but a failed political stint. It is clear for all to see that it was premeditated and stage-managed to fit into a narrative. The Patriotic Front has no issues with how people nomadically and politically align themselves. Students of political history know for a fact that individuals have sold out politically at one time or another and the actions or inactions before they do so are highly predicable. Nobody gets shocked after a bat falls to the ground in its sleep because it sleeps upside down and positioned to fall at any given moment. The leadership of the Patriotic Front and members alike can read through some of these actions by a section of members of the party pushing an agenda which is clear for all to see. We are not a party of political novices and under-fives but one led by a politically astute leadership with a rich and credible profile of Zambia’s political institutional memory. Individual members of the Party have a right to associate and disassociate. This includes them visiting persons and places of their choice. The carefree ones can opt to visit hell or the moon, as the case might be but it becomes an issue if by their visitation, they compromise or bring into ridicule Patriotic Front’s political standing and objectives. At that point, the relevant mechanisms provided for under the Party Constitution and Disciplinary code come into effect and affected individuals should be ready to pay the price. We know of political parties such as the United Party for National Development (UPND) which forbids any of their members from visiting State House or they are labelled traitors and the consequences are dire to imagine. We know of political parties such as the UPND which forbids its members from participating in national events being graced by the Head of State President Edgar Chagwa Lungu or they are treated as political lepers. It is also important to state that the narrative created by the Musenge story is fabricated as part of the stage management earlier on alluded to. It is aimed at painting a bad picture on the ruling party when it is reported that “a prison guard comes running with a telephone in hand shouting all of you stop what you are doing and get out, you will cause me problems, just get out”. This is another deceitful line in the story crafted to suit UPND’s narrative and the objective behind Mr. Musenge’s visit. The Patriotic Front is aware that there is a sustained public relations drive to malign this its Government worldwide with the international press having taken a stand and is everyday spewing a very negative outlook on Zambia. We are aware that part of this scheme is getting desperate voices in the ruling party and grant them media space in hostile media after they make such rehearsed media stints. Lastly, we are calling on Party membership across the Country to be vigilant and in high alert as they watch out for parasitic political opportunists among ourselves who seek to undermine the authority and leadership of our President Edgar Lungu and the Patriotic Front. We must collectively guard against elements that seek to dilute the Party’s core values and principles. Mwenya Musenge is free to visit anyone he wants. Democracy entails this. So scared of their own shadows! What happened to civility and compassion. Are PF this much ‘heartless’ and vindictive to not allow and attack anyone showing compassion to HH. What has become of this former Christian Country? Mwefipumbu mwe ba PF. Musenge visited due to his personal belief and nothing political here. Sunday Chanda, the fact that (1) you stopped Hon. Mwenya Musenge from visiting HH and (2) you hurriedly released a statement on Sunday, symbolises that your PF party is in a serious panic mode and deep down your heart you know it Sunday! We are not children, we read and analyze. Start preparing yourself because Hon Musenge is not alone in your PF Party sympathizing with HH, GBM and the entire UPND. You are actually making the opposition more stronger because I am looking at men of substance like Dr Kambwili, Dr. Xaviour Chishimba, Hon Mulongoti, Mr Tayali and Hon Musenge himself and their followers who are now opposed to your Dictatorial traits. By the way, where is your Mumbai Phiri since her half naked photo went viral? The moron Sunday Chanda has shared nothing of substance here. It is a mare rhetoric. Who would want to visit him to start with ? That seat need nullification and the man must be fired. IF ZAMBIA HAS BECOME A CIRCUS, WHAT ROLE DO YOU THINK MUSHOTA IS PLAYING FROM THE FOLLOWING LIST; MASTER CLOWN, ACROBAT, TRAINED ANIMAL, TRAPEZE ACT, HOOPER, TIGHTROPE WALKER, JUGGLER, MANIPULATOR OR STUNT-ORIENTED PREAK. Just like wh would want to believe you have a PhD? Why is he not allowed to visit HH and mwaliteta?? Mwenya Musenge is a political f00l.he made PF lose its Chimwemwe seat to an independent MP -a Mr Mutale whom PF didnt adopt to accommodate this failure in 2016.he now knows that PF will never adopt him in 2021 anywhere on the copperbelt,hence trying to be in good books with upnd.but upnd would only adopt Mwenya Musenge at its peril in 2021 because this man cannot win them a seat in any PF stronghold.Musenge is a finished politician who surely do not know what he is doing in life!! Lets face it,if anybody in PF was in jail,can HH allow any upnd member to visit a PF member in jail?NEVER!! !SO WHY SHOULD MUSENGE DO THAT IF HE RESPECTS PF AND ITS LEADERSHIP? Very low level of thinking! Njimbu, you have not yet evolved to where people can discuss democracy with you and your kind. If your blood relative, who belongs to a different political party, were in prison, would you visit them? If you would not, then you are still at the pre-ape stage of evolution. If you would visit them, then you are a big dictatorial hypocrite! Think through things before posting rubbish. sure why has this got to do with PF? does chanda work for prison services to be comenting? @Mushota:Mr Mwenya Musenge is not a MP.he made PF lose its chimwemwe seat in Kitwe to a PF member who stood as an independent in 2016. For you “spaka like lilo”, please not that NO NORMAL PF LEADER CAN VISIT HH OR OBVIOUS MWALITETA IN JAIL BECAUSE HH HIMSELF DO NOT ALLOW ANY UPND MP OR SENIOR LEADER TO BE ANYWHERE NEAR PF LEADERSHIP! !IF HH KNEW THAT IN A DEMOCRACY LIKE OURS,PARTY MEMBERS ARE FREE TO MIX,HE COULD HAVE BEEN ALLOWING HIS MEMBERS TO WORK WITH THE GOVNT OF THE DAY.HOWEVER,ITS A BIG CRIME IN UPND IF ANY SENIOR MEMBER IS FOUND ASSOCIATING WITH PF LEADERSHIP! !this is the reason why,PF also cant allow its royal members to be seen anywhere near HH!! Hence,Mwenya Musenge has expelled himself from PF by his evil actions!! Thank you for confirming PF using the prisons, police, courts and judiciary to settle scores…. Why do you then think you are any different from UPND? The same PF mouth say HH is not in jail for Political reason, that he’s a criminal like anybody else, the same mouth is saying people who visit him are showing Political colors? What is your position PF, regarding HH? Yes this was a brilliant move to show PF and lungu using the police, prsions and courts to oppress the opposition…..any one who says the police or judiciary is independent should just look at this…..
Last year Upnd called for the firing of Musenge after it was discovered that he was the chief maize smuggler, but today he’s a hero just because he has decided to visit HH. Any chaff is welcome in Upnd. Any the people of Chimwemwe soundly rejected this moraless gangster. And Lungu has completely sidelined him. When you cant deal with Zambia Open Dorah Siliya over the Malawi Maize scandal, why do you want to bring Mwenya Musenge in this? You PF hooli.gans have no brains at all! Ar.sewhores! @8.1 you must have eaten your placenta at birth. For how else can you fail to respond without insults? The Zambian Voice has pleaded with President Edgar Lungu to act now and fire Copperbelt Minister Mwenya Musenge. Speaking at a media briefing in Lusaka today, Zambian Voice Executive Director Chilufya Tayali says MTayali Chilufyar. Musenge’s reaction to the allegations against China Copper Mines is questionable. He says it is clear that he is covering up something which can only be between him and CCM other than the government he represents. Mr. Tayali notes that Mr. Musenge has also brought in other people including the president thereby indirectly implicating the Head of State and as a result bringing the presidency into ridicule. Musenge has exposed himself and it will be difficult to trust him even in 2021. It is Mr Mwenya Musenge’s Right to visit an inmate of his choice during the visiting hours in our Jails. The Party or whoever stopped him from visiting HH is wrong and is violating his right to associate with a person of his choice. HH has Ranching Farms throughout the Country so are PF members going to be stopped eating beef on suspicion that the Beef could be coming from HH’s Ranches? Thats total madness. This type of thinking or pettiness is retrogressive. People should be left to enjoy their Rights as they please. Sunday Chanda should shut up and stop interfering with people’s rights to associate with friends of their choice. That is why we live under the budding fictatship of lungu. Chanda Mafi yobe. Leave mwenye musenge alone and sort out the needless deaths happening in UTH. Namufilwa ukuteka amatwi yali kuli HH. Each morning you wake up you are wasting time keeping an eye on HH and giving nothing to the suffering masses. You are not indispensible. Your time will come. Tekeni abantu and provide for the people . Stop this nonsense. @Chibwe alas Hachiibwe,spaka like lilo,and all of you upnd cadres,please do not educate us on this issue because all wise Zambians know how HH prevents upnd members from associating with PF leadership.if Mwenya Musenge is from upnd then he goes to visit president Edgar Lungu,today you could have called him all sorts of names saying “njala yamu nyokola”,etc.upnd only supports what suits them! !WE KNOW YOU TOO WELL!! Even “if” that were true, HH does not use police, prisons or the courts to stop any one execising their democratic right of who meet and who not to meet . You njimbu was signing just recently of how independent of lungu the judiciary is ….now you have been caught admitting lungu is using police, prisons and courts to oppress the opposition and the democratic rights of citizens… !!!. I wonder why PF should be worrying about ba Musenge. It is reactions like this from PF that confirm that PF intends to harm HH. All well meaning Zambians and the international community need to step up pressure on this WICKED regime to release HH immediately. PF IS WICKED! Sunday Chanda is spot on with his point. Mwenya Musenge is a traitor and even me as a member of UPND cannot trust him. It is these same people who would displace us of we formed govt. Musenge is trying to come to our party but we must be careful who we embrace. THIS TELLS THE NATION A LOT FROM WHAT PF FEELS. HH CAN DIE IN PRISON, HE CAN GET SICK IN PRISON, THE PF WILL SAY YES OUR ENEMY CAN BE SO. AND LET ME TELL THEM THAT GOD IS GOD AND CAN TURN UPSIDE DOWN ALL YOUR CRUELTY. TODAY YOU ARE HAPPY BUT COME TOMORROW ALL OF YOU SHALL RUN AWAY. MWANAWASA WAS APPOINTED BY CHILUBA AND WE SAW HOW SOME OF YOU SCAMP OUT OF ZAMBIA LIKE RATS. IT COULD BE HH OR SOME ONE ELSE AND WE SHALL SEE HOW YOU SHALL BE. Quite absurd to say the least.So this stupid PF puts politics above human rights ,due process and respect for rule of law ? A List of paid agents for racists is growing. A Weston Zambara (Malawian?) today featured on eNCA attacking Zambia as turning into a dictatorship. Zambara who works for Institute of Justice and Reconcialiation cited Catholic Bishops and establishment of Commission on violence as his grounds for attacking President Lungu. I am sure even the lady (Cathy Mhlahlana) who interviewed him was left shocked with Zambara’s intellectual deficiency on the political climate prevailing in Zambia. Too many jackals are being bred in South Africa. What really itches western imperialists is Zambia’s role in the liberation of South Africa, Mozambique, Namibia and Zimbabwe. Their live project is to cause havoc in the mineral rich South Africa and Zambia. @spaka like lilo:where have you seen me admiting that president Edgar Lungu is using the police or judiciary to oppress opposition leaders? Is HH the only opposition leader in Zambia?if HH didnt commit a crime in Mongu,do you think the police would have arredted him?WHY CANT YOU FOR ONCE USE YOUR BRAIN TO THINK?TRIBALISM WILL KILL YOU!! in life one has to be objective and not supporting blindly.HH WAS 100% WRONG IN MONGU.IF IT WAS DURING KK OR FTJ CHILUBA’S ERA,HE COULD BEEN BURIED IN BWEENGWA BY NOW!! !UPND SHOULD BE THANKING ECL FOR HIS KINDNESS!! there are no shortcuts for law breakers.only courts shall free or convict HH! !FOR NOW HE IS STILL INNOCENT UNTIL PROVEN GUILTY BY OUR COURTS!! 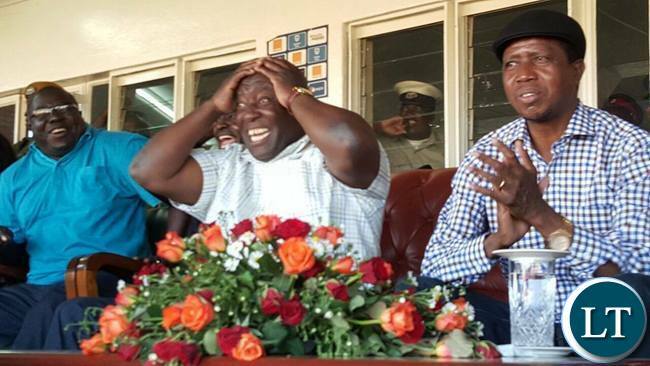 By admitting lungu stops people visiting HH you are admitting he uses police, prisons and courts…. And if Zambia is a land of laws as you claim why is kiezer Zulu not charged with assaulting a police women at the stadium ? and he had beaten HH twice in 18 months.so whether HH is freed or jailed,ECL shall lose nothing because he will remain Zambian president until 2021 or even beyond if voted again by majority Zambians!! For HH’s mongu saga “malibu yakuilembola”. Sunday Chanda even lost an adoption primary election in his home village in Mpika. So he is not popular anywhere. He got that full time job in PF out of sympathy. He would be jobless. Just a short while ago, the PF stated that it had nothing to do with HH’s arrest. It was between him and the criminal justice system – not to mention the ‘independent’ judgement of the police. So why would the party be concerned with who visits him? How many times do we have to show and explain to all and sundry in Zambia that we have the worst clueless animal of a so-called party in government and it is not good for anyone? Visiting is not a problem, but follow procedure please!!! We are one Country!!! I don’t know when last you went to Zambia if you are not one of those Zambian’s that can’t even visit Zambia because of their Visa over stay overseas….I will educate you for free: things are bad the so called procedures you mentioned only apply to the uneducated PF thugs and their families so please re visit your statement again…I don’t support any political party in Zambia but I am concerned about my Family and I have eyes to see that something is seriously wrong….I would rather go back to the UNIP days in exchange with this madness…. U must be a very intelligent person. I like the way you analyse issues. U make very constructive comments which are educative and unifying. Dictators trying to justify theselves. Zambians are in dare need of a better economy and better government policies. We are sick and tired of a non functional government of PF. Fuel price is very high. Electricity tariffs are extremely high. Essential commodities are selling at very high prices. There are just too many forms of tax payment which Zambians are subjected to under president Lungu’s leadership. For sure things are not alright in our country. As Zambians we all ought to stand up and join hands to condemn this cruel government. Pa zed bululu, use politics n tick. Some cheer while others are getting belly full. On which side are you? Ba pf it will backfire on you guys. All the evil you are doing it won’t be long before God turns the tables. Vakulola vye. @26 (Lusaka) visiting has never been a crime to any institution but one should follow that instruction’s laid down procedure for that institution e.g hospitals there is a time table what time to visit if one is late you are sent away, banks there is to doors in and out, in some offices one has got to make an appointment to see the boss including HH’s home where even Mr. can’t go without making an appointment with HH, examples are too numerous to mention. So what is wrong for Mr. Musenge to follow procedure of the correctional is it because it is about HH that is why all of are making so much noise? Give us a break, a jail cannot be a jail if criminals can be visited anyhow. some of these phds and doctorates from primary schools are a problem. mr musenge is beeing punished for his clear senses . in pf every one is an enemy if he/she does not see anything wrong in upnd. foolishness indeed .